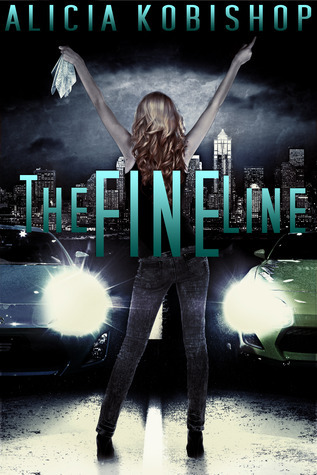 The Fine Line by Alicia Kobishop was given to me in exchange for an honest review. Liv, the main protagonist of this story, is your typical sad girl. She's got the whole everyone-you-love-leaves-you mentality going on. Then comes the hunk of this story..Logan Tanner. All smooth moves and nice body. He's a drag racer and a total flirt, what more can you ask for? At first glance, he's a bad boy but really (like every bad boy in a book) he's all soft inside. The rest of the story just consists of Liv being insecure and Logan always having issues and blah blah blah. This is where it got a bit annoying for me when Liv would be all, "I LOVE YOU LOGAN!" To, "DON'T TOUCH ME!!!!" In 5 seconds flat. It got pretty annoying actually. This book is the perfect example of an NA novel. Just the right amount of steam, heart-wrenching drama, and hunky boys! I wouldn't say that it's a 'unique' read though. Everything about the book screamed predictable, but in a good way. There was not enough meat in this story for me to totally fall in love with it. Yes, I did get a bit teary a couple times, but doesn't every girl when it comes to these sappy stories?! All in all, The Fine Line was an okay read. Not exactly lust worthy, but it was still nice.